There was a $200 desktop at WalMart that sold out a week after its release. The standard featured desktop PC was running on gOS, a Google inspred linux operating system. SO far there have been no scandals no r very bad things said about the desktop and the makers of the so-called gPC, Everex are going into the ultra mobile niche. Currently dominated by the Asus EeePC, the ultra mobile personal computer (UMPC) niche used to be a class above regular notebooks. They were usually underpowered and overpriced. Their main selling point was simply the size. That all changed with the EeePC. At a staggering $300-$400 MSRP, the EeePC was affordable and full featured with a Linux OS, WiFi, webcam and USB connectivity. The Linux OS running on a 900MHz processor and a 1GB ram was enough for any personal computing and web surfing need. 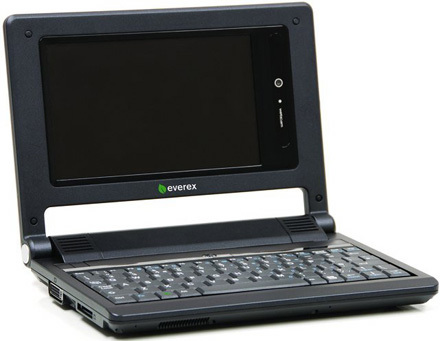 Now, with the EeePC making waves for the UMPC’s, Everex will be joining the bandwagon with their Nanobook (aka CloudBook). It’s roughly the same size as the EeePC but it’s got more muscle, 1.2GHz CPU, a 30GB hard drive, 512MB of RAM, WiFi, a card reader, two USB ports, and a DVI out. The 30GB is the knock out punch. AS compared to the 8GB storage on the EeePC, the Cloudbook is the way to go. It’s not available yet but it will be as early as January 2008. With all the specs and that price tag, the Everex Nanobook is definitely something to keep people from buying the beloved Asus EeePC (until the review come at least).